November | 2017 | You can't evict a Movement – You can`t evict Solidarity! “Ahmed H had yet another trial today where he was accused of terrorism. The best note about it came from Ahmed H himself: “I cannot recognise myself, I lost my identity. Am I a man of Georg Soros (as Fidesz accused on Monday), a terrorist or a journalist? !” His humor gives a painfully accurate message about the nature of the overly politicized show trials he is going through. This man will remain jailed for at least three more months without being pleased guilty of anything. Der Prozess wird an drei Tagen im Januar weitergehen. This entry was posted in Ahmed H., Balkanroute, General, Prozess, Röszke11, Repression, Solidarität, Ungarn and tagged 2017, Ahmed H., Grenze, Prozess, Röszke, Röszke11, Repression, Solidarität, Szeged, Ungarn on 2017/11/12 by can't evict solidarity. Der Prozess gegen die 58 angeklagten Besetzer*innen des Hurriya-Squats wurde heute (8. November 2017) erneut verschoben. Diesmal auf September 2018. Was das für den Prozessverlauf und unser weiteres Vorgehen bedeutet, werden wir nach dem nächsten Prozesstermin gegen die Besetzer*innen des Albatros-Squats Mitte Dezember auswerten. This entry was posted in General, Griechenland, Hausbesetzung, Hurriya, Prozess, Repression, Thessaloniki and tagged 2017, Griechenland, Hausbesetzung, Hurriya, Prozess, Repression, Solidarität, Squat, Thessaloniki on 2017/11/08 by can't evict solidarity. [Röszke11] Revisions-Prozess gegen Ahmed H. gestartet – Solidarität! Am 30.11.2017 ist der Gerichts-Prozess gegen Ahmed H. in die zweite Runde gegangen. Er wurde vor einem Jahr in einem skandalösen Prozess für den Protest in Röszke 2015 zu 10 Jahren Haft verurteilt. Heute am 2.11.2017 ist der nächste Verhandlungstag. Wir dokumentieren einen Text der Solidaritäts-Gruppe Free the Röszke 11. Informiert euch, zeigt eure Solidarität! Ahmed H.’s case will be retried on the October 30th and November 2nd in Szeged. Join the decentral actions before the trial and spread the word!Ahmed H. is one of the many people who protested on the border of Hungary at the Röszke/Horgos crossing to open the borders again on 15th September 2015. A few hours before Hungary had closed them and had made any crossing a criminal offense. 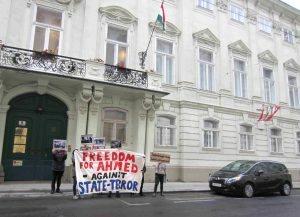 Afterwards Ahmed H. was captured by Hungarian authorities and they claimed he was a terrorist leader of the protests. 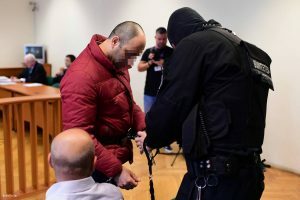 On the 30th of November 2016, after over one year of isolation in prison, he was sentenced to 10 years of imprisonment for committing an “act of terrorism” and is since then in high security prison in Budapest. All requests for visit were rejected or simply ignored by the authorities. He is being isolated additionally since he cannot receive letters, except from his wife.On the 15th of June 2017 in Szeged, Hungary, Ahmed H. had his second instance trial which referred the case back to the first instance court to reconsider the terrorism charges due to “lack of reasoning and interpretation”. This reconsideration will take place on the 30th of October and continue on the 2nd of November. The trial against Ahmed H. is a racist showcase that tries to strengthen the idea that all migrants are terrorists and to criminalize another protest against the EUropean border regime (read more about the previous trials on our blog: http://freetheroszke11.weebly.com/).How can you support? Join our decentral actions all over Europe to put pressure on the Hungarian government and court system and show Ahmed that he is not alone! During the days around the trial dates on the 30th of October and 2nd of November protests at embassies and consulates in different cities will take place: Budapest, Vienna, Marseille, … If you want to organize a protest at your local embassy/consulate or other solidarity actions contact us and we will link it on our website. Also more creative and subversive forms of protest are welcome! Spread this update, the information about the trials, our website and the crowdfunding over your networks! Solidarity is our weapon ! We continue to struggle for the freedom of Ahmed and against the repression of state institutions! Migration is not a crime as fighting for freedom is not terrorism! This entry was posted in Ahmed H., Balkanroute, General, Protest, Prozess, Röszke11, Repression, Solidarität, Ungarn and tagged 2017, Ahmed H., Grenze, Prozess, Röszke, Röszke11, Repression, Solidarität, Szeged, Ungarn on 2017/11/02 by can't evict solidarity.